Takes the Lite program and adds in the menu, allowing the meal tickets to print out only the dislikes and likes that pertain to that meal. Performing intake studies is easy. 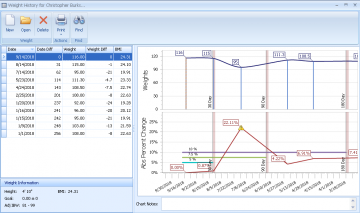 Professional looking Nutritional Assessments can be completed within the program that includes labs, weights and decreasing charting time. 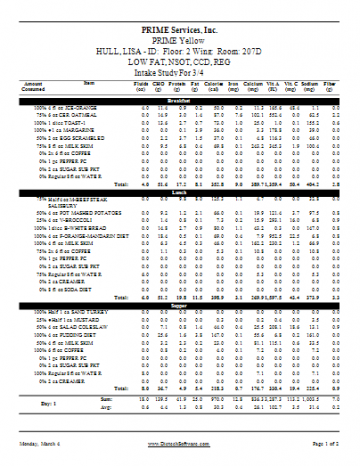 Tube feed reports and calculations are all at your fingertips. 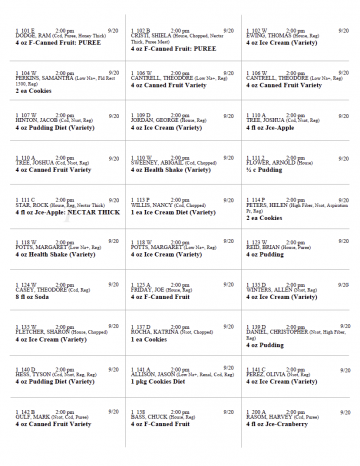 We even have a 3 to 8 week menu cycle available with the program that can be altered to meet your facility’s needs. Warning notes can let you know when a resident is due for assessment, weight or even a diet order review. This program can be used in standalone and corporate healthcare facilities. Variety of sizes available for tray cards. Ideal for small to mid size skilled nursing facilities and Continuing Care Retirement Communities. Custom Side Notes: Name Alerts, Intake Studies, Allergies, and others. Ability to highlight and color key text. Color coded Item boxing for different service needs. Set up in the order that you would like the food/drink items listed according to the functionality of your kitchen. Clear instructions to staff of residents’ needs. Preview of the physical tray ticket and nourishments to verify accuracy of the ticket without having to print out a ticket. Gives you the rationale as to why the resident is receiving items on their tray ticket. Help you determine why items are added/replaced. On a selective menu, a resident is offered choices based on their Diet Order and preferences. Staff can do selective menus at the point of service, a meal ahead, a day ahead and can be used as room service. If an employee is trying to add in an item that the resident shouldn’t have because of a dislike or an allergy, the user is prompted with a warning and instructions. 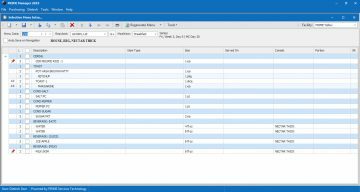 Selective menu reports can be customized to replace the tray ticket if time management is an issue. Increases resident satisfaction and reduced food waste by giving the resident what they request. Weekly report can be used in conjunction with resident’s family to help pick out choices. 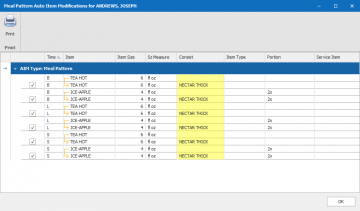 Dietech provides a comprehensive list of items that you can modify and add to. 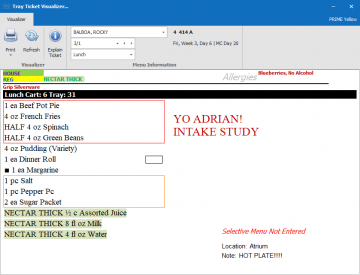 Classify items as food, beverage and supplements to create item usage reports. 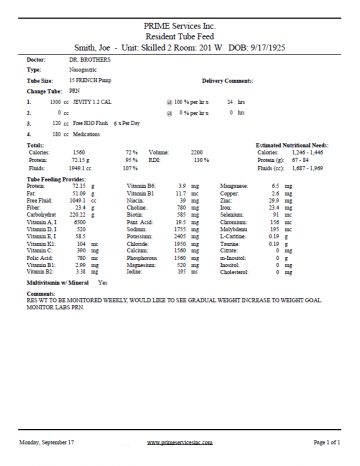 Items can be linked to nutritional data for nutrient calculations. 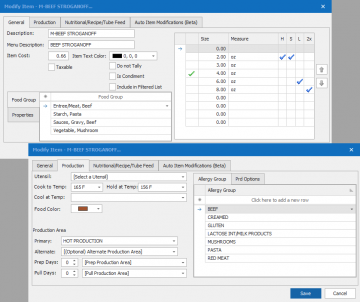 Auto Item Modification – The area that you can teach the program to automatically handle item extensions in the menu cycle, meal pattern and selective menus. Starting place to manage all your residents and generate reports. Navigate with ease; adding in new residents, searching for existing residents, discharging and readmitting within one screen. Sort and filter by unit, room, name, diet, age or weight. Display resident profile picture on grid and on meal tickets. Warnings to Staff for missing diet order, weights, tray line assignment, and assessments. Helpful Location to meet resident’s special needs, likes, dislikes, allergies and special requests. The area where you can add on non menu cycle items, such as chocolate pudding every day, daily item substitutions. In addition to picking which day you want the item to be given, you can pick how long and when to start giving a certain item. The adjustment area gives your staff flexibility to handle resident dislikes, likes, replacement items and portion sizes. Override the typical item extension when a resident requests a special item. For example, a resident is on a carb controlled diet and they receive the diet apple pie. The resident requests “the real” apple pie, the user could make an adjustment to provide “the real” pie, at half portion. Heart of the program where you determine how food items are going to be extended to which diets and what consistencies. Menu Cycle can have an unlimited number of Diet Types/Consistencies. Additional Diet Types/consistencies can be added or removed after a menu has been started. Menu Preview allows you to see how an item or meal will be extended on your tray tickets to verify that your work is correct. Unlimited number of entree choices. For example, your location can have one entree and then move to the always served, or you could have multiple entrees and then move to the always served. Menu Cycle length can vary from days to weeks. For example, a hospital could have an extensive 1 to 9 day menu cycle, where as a long term care facility could have a 3 to 8 week menu cycle. Always Served/Always Available – Food/beverages available at a particular mealtime that can be put on daily rotation. For example, you can have on rotation a ham sandwich on Monday, tuna salad on Tuesday, grilled cheese on Wednesday, etc. AIM – With AIM you are teaching the program how an item is extended. 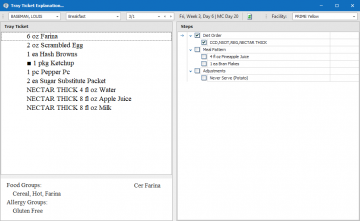 In the menu cycle, when you add/replace an item, that item is automatically extended for you, keeping you consistent with the diet manual of your facility/hospital. Exceptions can be made to the AIM when needed, for example, a holiday. Syncing Items – Items that are repeated on your menu multiple times can be linked together to ensure they are extended the same way throughout the menu. Saving you time when changes in the menu need to be made for an items. Synced items can be changed on one day and any corresponding days are also changed. For example, 8 oz milk is served each day at breakfast and the Renal Diet has been changed to receive 4 oz. Changing this on day 1 will change it for all of the linked days of your menu cycle at breakfast. Create one time or recurring menus to replace the meal to be served without adjusting your main menu. 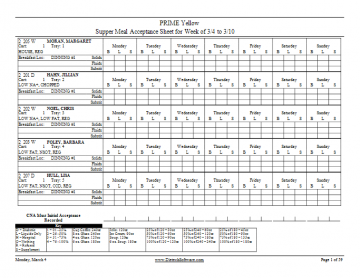 Your reports such as tray tickets, posting menus, and extension sheets are all showing that temporary menu. After that temporary menu day occurs, the system automatically reverts to the main menu without any user intervention. This is especially useful for religious or other holidays like a picnic for July 4th. This can be used for Emergency Menus due to weather or natural disasters. Swapping – Ability to swap one meal or portions of a meal with another day. For example, your delivery didn’t include Salisbury steak for your lunch meal. You can swap the whole meal or just the entree keeping the vegetables and starches the same. Post-able menu showing entire day’s menu on a page. User selected diet type and consistency posting menu for the entire week. House posting menu for the entire week showing optional alternates. 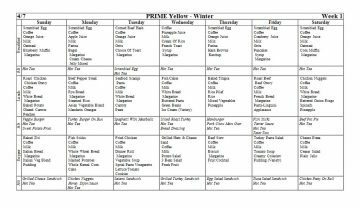 Menu showing what the resident will receive for the week taking into consideration diet order and preferences. Menu showing weekly choices available for a resident. This is commonly used when families visit to help make selections for the resident for the upcoming week. 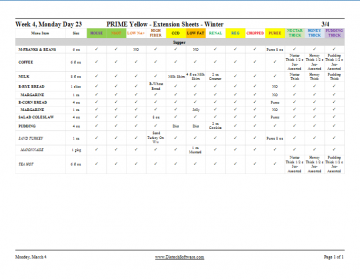 A report that shows you the breakdown of your menu cycle items for each day and mealtime by diet type and consistency. This report can be put in your binder to show for regulatory purposes. The colors used for your diet types and consistencies match the colors that are used on the tray tickets. For example, NSOT is colored with a green background and a red font as is indicated on the extension sheets and tray ticket. Also known as diet spreadsheets and diet breakdowns. Way for your facility to view the % of daily requirements for the entire facility or each specific resident. Full Day or by meal. 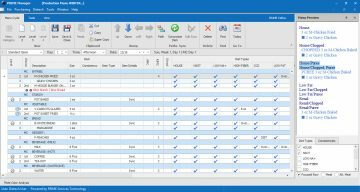 Ability to choose what nutrients needed for reports. 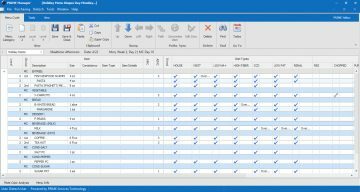 Can produce reports for specific diets/consistencies. Easy to generate and print labels. Tally of daily required nourishments. Helpful for nursing and dietary staff to give the assigned nourishments at the proper times. HIPPA compliant label (not shown). Include feeding status or diet order on nourishment label for resident safety. 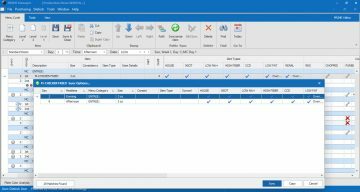 Consumption report for your nursing staff to record resident intake for meal and nourishments in both a daily and weekly format. 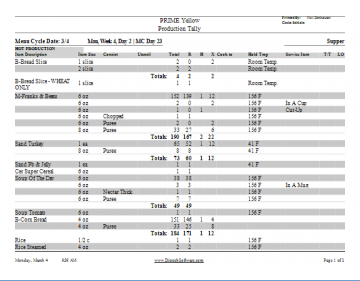 Track, monitor and generate resident daily/weekly/monthly weights. 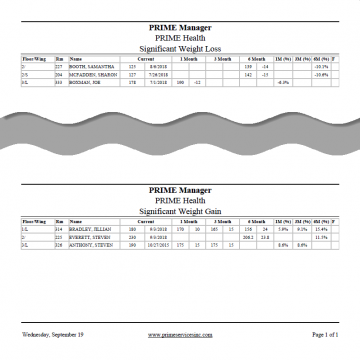 Track and generate significant weight gains/losses (30, 90, 180 days) reports. Reports that reflect residents who have had a significant weight loss or gain based on the facility’s parameters. Staff records consumption on an individualized resident intake report. Intake range of 1 to 3 days. Simple facility specified nutritional values that display how much the resident has consumed for the average day range. USDA nutritional values that display how much the resident has consumed for the average day range. Resident labels for delivery of tube feed products that include: Name, room, customized delivery time, product and diet order. 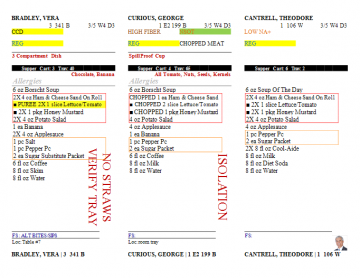 Tool for determining tube feed product’s nutritional values, based on doctor’s orders. 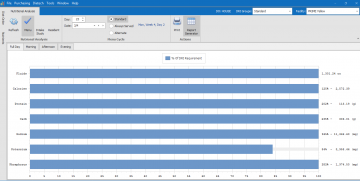 Summary, lists, and calculated reports on both individual and facility level. Is Dietech Production right for your location? Contact us now for a demo!